The winger has returned to McDiarmid Park on a two-and-a-half-year deal. St Johnstone have announced that they have signed winger Michael O'Halloran for a third time. O'Halloran has signed a two-and-a-half-year deal after leaving Australian A-League side Melbourne City. The 28-year-old will be at home at McDiarmid Park having played as part of the Scottish Cup winning side in 2014 and also having enjoyed a spell on loan from Rangers three years later. 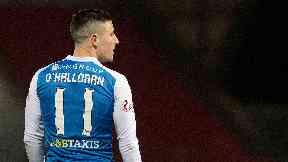 "It's great to be back here," O'Halloran told St Johnstone's official website. "It was an easy decision because the club has always felt like the right fit for me. "I feel really comfortable here playing under a manager who has had a huge influence on my career. I think it's obvious that I've played my best football here at Saints."